We emerged from the old city in view of the Citadel and, within it, was one of the most impressive buildings I have ever seen – the Alabaster Mosque. At the time, I was completely unfamiliar with the Muslim religion. 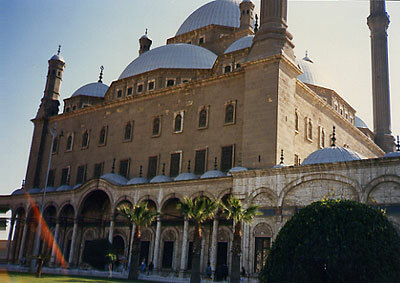 I walked through the entry of this grand complex and in the center of a large plaza was an elaborate stone shelter that covered taps and water for washing before entering the mosque. I was given cotton ‘booties’ to wear over my shoes. Had I understood why we were asked to wear them, I would have been much more inclined to remove my shoes. 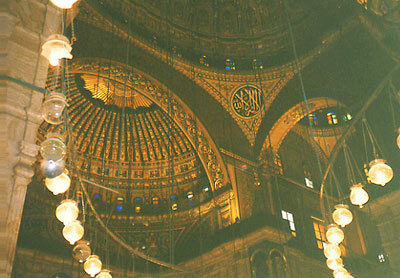 I barely remember the transition between the outside brightness and the opulent dimness of the inside of the mosque. I entered the Notre Dame Cathedral in Paris a week later and my instinct in such a grand building is to always look up. I believe that buildings of worship are designed that we might look up in the direction of heaven with awe. Unlike the stark stone carvings of the cathedral, the domed ceiling of the mosque was covered in patterns and script that seemed to weave through itself. The colours were richly applied and surrounded by gold. I am certain the visual experience of the place blocked out the rest of my senses – I don’t remember hearing the voice of the guide. That same day we visited the ‘Hanging Church’, one of the oldest Coptic Christian Churches in the country. “Copt’ is the a Greek “Gypt”. There is an excellent site covering the history of the Coptic Church in Egypt and this church in particular here. The Church was tucked into this tight area sharing a walled entry with other buildings. There was a staircase leading up to it. I was able to get a photograph of one of the icons, even though it was incredibly dark inside the building. Unfortunately, I cannot recall the story behind it. If someone knows the significance of it, I would be delighted to hear about it. The following day brought us to the first of the ancient legacies of Egypt. After fighting the gridlock of another series of Cairo streets, we made our way to Saqquara and Ramses II’s city of Memphis. (The link I gave yesterday links the Coptic Christians to this city – in case you are interested!) 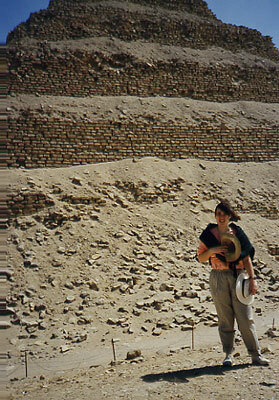 In close proximity to these was the Bent Pyramid – bent because its angle proved to be too steep for the weight of the stone construction and collapsed. As Cairo began to fade behind us, the bus began to follow a road along side one of the many canals flowing into the Nile. 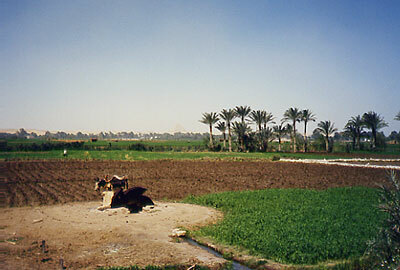 Flat farms flanked the canal, interrupted occasionally by a grouping of trees and irrigation systems. Water wheels were turned by mules which circled at a pace as slow as a heartbeat and as old as the river. Water filled the capillaries of the fields giving life to their crops. The flatness gave the illusion of closeness. I could see so far down the road I was surprised at how long it took to approach distant landmarks. There was little to mark the presence of Memphis when we arrived. There was the remains of a single statue of Rameses II. The Egyptian government was in the process of shoring up the ‘Step Pyramid’ so we were unable to tour inside it. The most moving scenery, however, proved to be the most ancient – the Sahara itself. Looking across the desert sands did not leave me with the foreboding that I might have expected. I felt less foreign there, at that moment, than at any other during the trip. The desert exists in a constant state of flux and mutability and yet its constantly shifting sands seemed to demonstrate a lesser change than the kingdoms it witnessed. Tomorrow… Sphynx, the Pyramids, camels and an afternoon alone…. It is interesting that your very first trip was to Egypt. That’s a good indicator of what you were working on spiritually. I like that the trip inspired the artist in you. Thanks, Kris. Writing about it has been a wonderful way to remember the ‘beingness’ of foreign travel, if I may use the term…. Thanks for sharing your travels. I hear you about the effect of flatness on distance. Years ago while traveling in Arizona, the rim of Meteor Crater loomed on the horizon. It took longer to get there than I would have thought & that rim was far higher than it’d seemed. Hi Lana – I would love to visit Arizona… part III in a bit…. Hi Michelle, Your blogs show that you don’t just visit an area, you experience it not just physically but emotionally, spiritually and intellectually.